Many of the tasks that you currently do with your computer take place by means of the browser, that is why it is so important to choose wisely to choose one that meets all your needs. If you're one of those kinds of users that really like downloading all kinds of contents from the Internet, Wyzo may be the ideal browser for you, because it is a development based on the Firefox browser by Mozilla that has a download manager and an integrated BitTorrent client, in such a way that you will be able to download all the films, images, songs and programs to your computer as fast as possible. 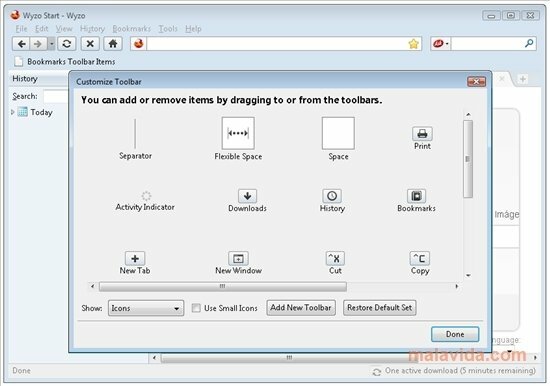 - Compatibility with Firefox add-ons. - Appealing tab-based browsing system. Furthermore, the interface is very appealing, at the same time that it is intuitive, something that makes the program adapt perfectly to any modern operating system. Download Wyzo and discover the ideal browser for those people that like downloading all kinds of programs and other contents from the Internet.